The Black Bear Destroyer Rubber Band Shotgun - Shoot it anyway! This rubber band machine gun is easy to load and fire. Called as the Black bear Destroyer Rubber Band Shotgun can easily load up to 9 rubber bands at once. Assemble it fully, the lineup the six mercenary army men targets and you are good to start firing. With a maximum range of up to 20 feets, each pull of the trigger releases rubber band. Its range depends upon the type of rubber you use. Its fully guaranteed by the manufacturer and if any malfunction, you can simply return it and ask for another or full refund. Black bear Destroyer Shotgun set includes 1 rubber band gun which is about 13 inches long, 6 small army men targets and set of rubber bands. 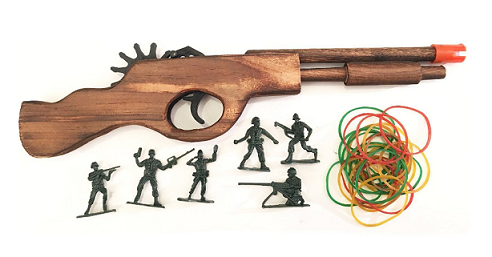 This rubber band machine gun is suitable for ages five and older. Still, adult supervision might be advised.